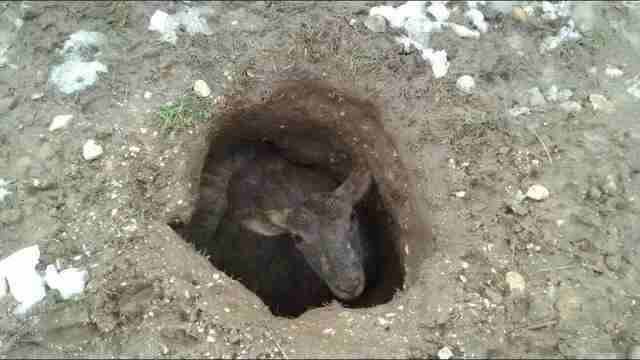 A man was out with his kids in England when they spotted an extremely unusual sight - a sheep sitting in a deep hole, practically frozen. The group attempted to pull the shivering sheep out, but the hole was six feet deep, and the poor sheep had little strength left. The family contacted the RSPCA in hopes that they could help. An officer arrived on the scene, and the Buckinghamshire and Milton Keynes Fire and Rescue Service were also called to save the struggling sheep. "People traditionally think that fire and rescue services only become involved in animal rescues when cats are stuck up trees," station commander Nick Honor said in a press release. "The reality, however, is very different." 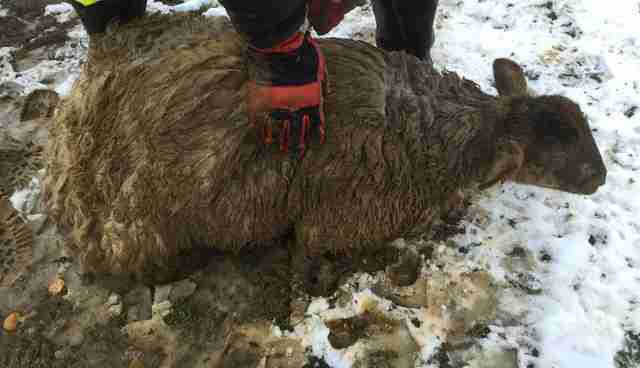 The rescue team was finally able to pull the frightened sheep out and, miraculously, she had suffered few injuries. Rescuers suspect that the sheep had fallen into the hole overnight, and if the family hadn't discovered her she likely would have froze to death. "The ewe had grazed her back legs and was very cold and weak but we stayed with her for about an hour after getting her out, and she eventually managed to walk over to the rest of the flock," RSPCA officer Kate Wright said in a press release. Wright was able to track down the sheep's owner as well, who said they would keep an eye on her to make sure she was OK.